Cat pencil sharpener meows while it works! 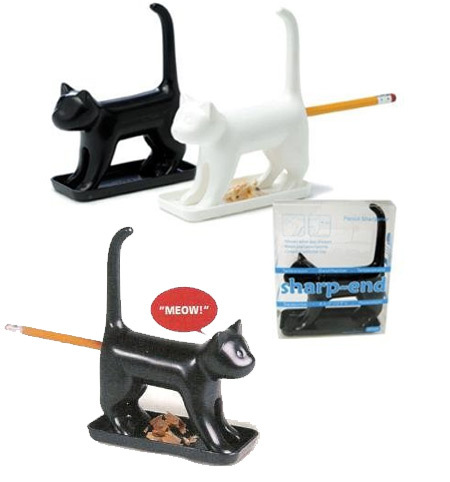 A great home or office addition for feline fanatics, combining fun with function. 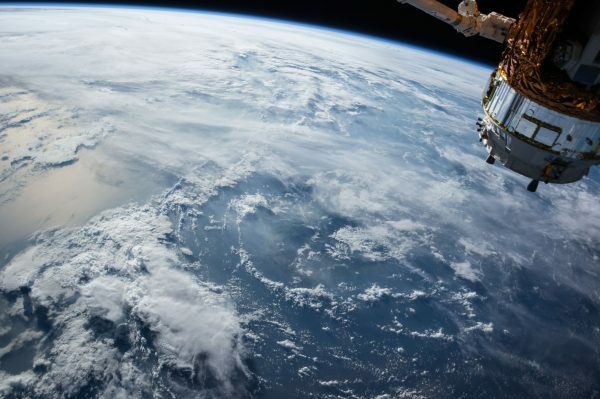 It hones graphite faster than a cat sharpening its claws on a scratching post. You can buy it for $17.55! 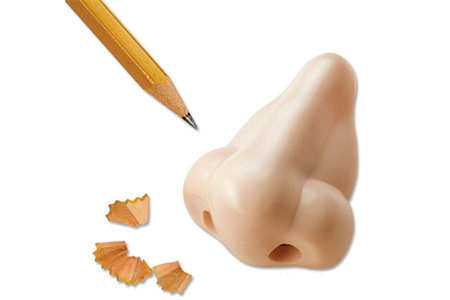 Stick a pencil up this 2-1/2" (6.4 cm) long plastic nose, then give it a twist and it will come out clean and sharp. For just $5.13! 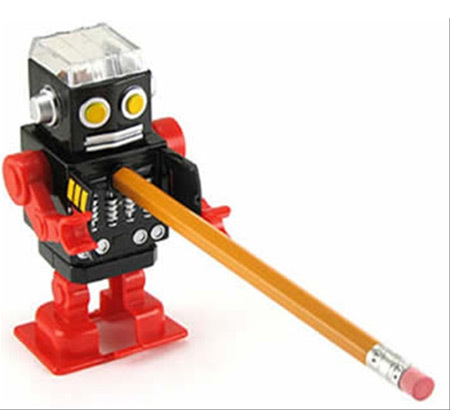 Robot Pencil sharpener toy is too cool. 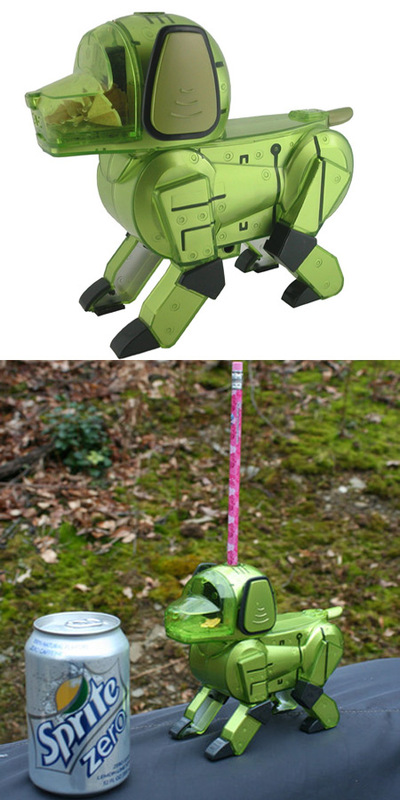 This robot walks a bit after you sharpen your pencil and everyone loves him! He is a great small gift or add on gift and a great desktop toy for the whimsical child in us all. The robot is about 4" tall, it comes in a cool gift box and is a good pencil sharpener as well! You can have it for $6.50! 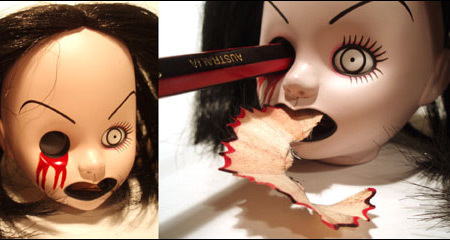 This “Living Dead Dolls” pencil sharpener is a doll head and you need to stick the pencil into her eye to sharpen it. 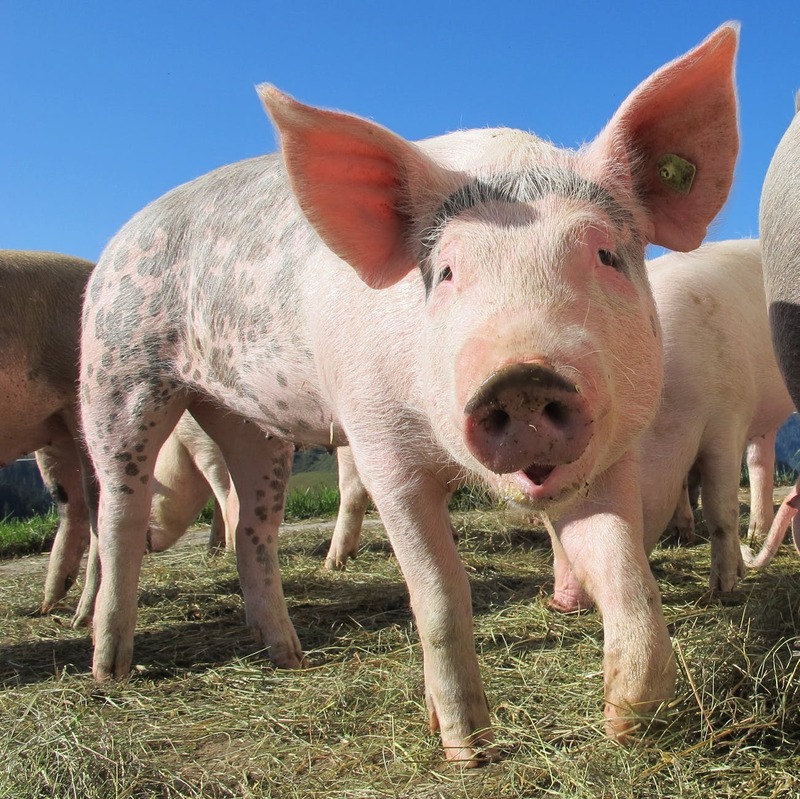 There is a little button on the back of her neck that pushes the shavings out of her mouth. Suction cup this little pup to your desk, and you'll find yourself grinning each time you go to sharpen your pencil. Woof! 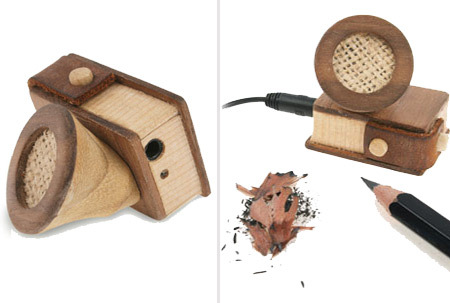 Whilst this mini external speaker for iPods and other Mp3 players is by no means the first wooden speaker system we've come across in our daily trawl of the net, it is certainly one of the most curious in that it comes complete with an integral pencil sharpener! This silver Stegosaurus walks when you sharpen your pencil on his belly! If you don't have any pencils, you can wind him with his key. His hinged head fills with pencil shavings for easy cleaning. This dinosaur is inspired by popular Japanese Tin Toys of the 1950's. You can buy it for $8.99! 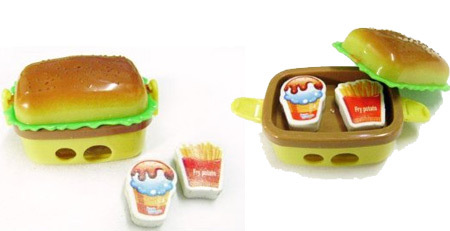 Now don't be fooled, this Hamburger is actually a handy Pencil Sharpener! The sharpener can fit average and larger pencils. The lid locks with two snaps at the side. There are two small erasers included. They are stored in an extra compartment in the lid. And you can actually buy it for $5.75! 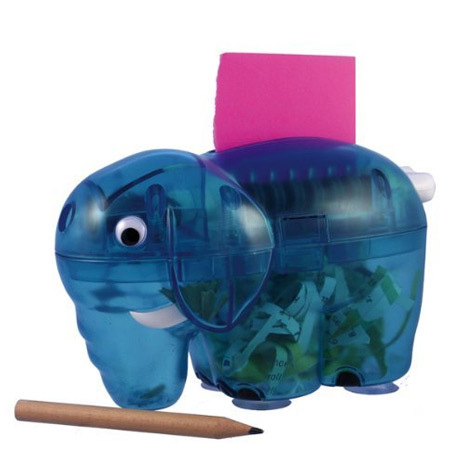 Elephant Paper Shredder and Pencil Sharpener - Great fun gift! Ideal for shredding credit card receipts and other bits of paper. For all you Twilight Trilogy fans: Bella Swan had this elephant on her desk in the Twilight movie! And you can have it too for $13.99! Looking for friendly home or office dog perfectly trained for sharpening pencils in the blink of an eye. Never barks. 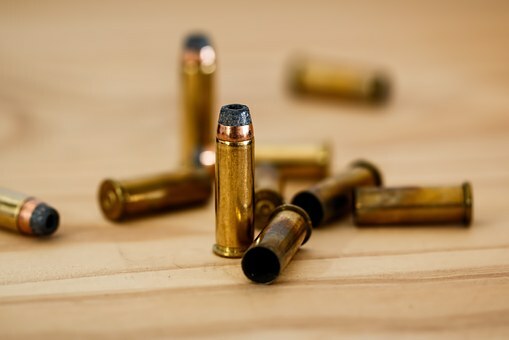 Quietly sits on desk staring at you. Never eats. Gets by on 4 AA batteries. 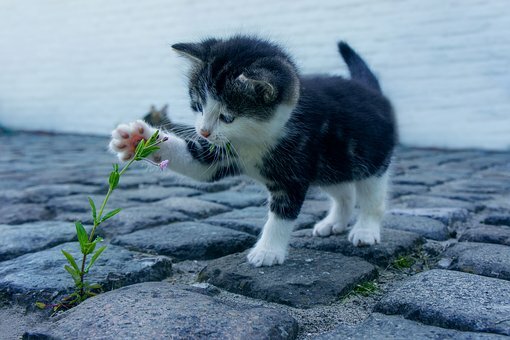 For just $21.99! 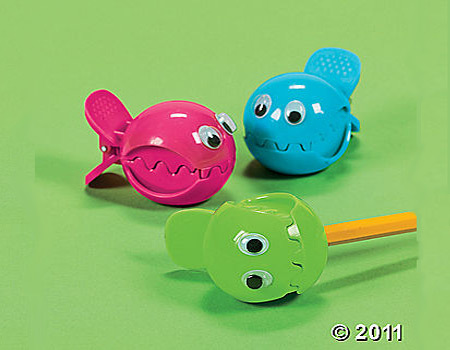 Wiggle Eye Fish Pencil Sharpeners. 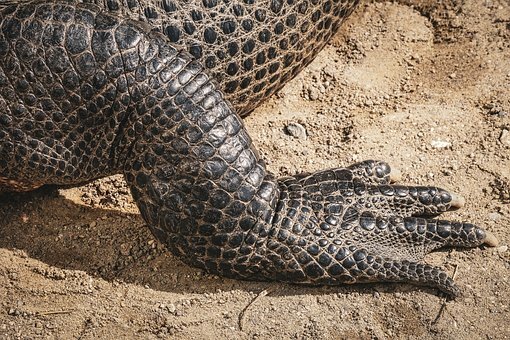 Squeeze their tails to open them up! Fun for beach luaus and other summertime events, these plastic wiggle eye fish pencil sharpeners will add an ocean of fun to goody bags and treasure chests. And you can buy a set of 24 wiggle eye fish pencil sharpeners for just $10.89!